Sleepy Time herbal extract is a combination of three powerful yet gentle herbs that promote restful sleep and peaceful nights. Tired of sleep-deprived nights? Try our Sleepy Time herbal extract! When your little one isn’t sleeping, you just don’t feel well — and neither do they. Quality sleep is so important to a healthy family! Our Sleepy Time Herbal Extract is a gentle, kid-safe formula that contains catnip, skullcap, and passionflower. Catnip and skullcap both help to promote restful sleep, while passionflower reduces anxiety. This combination can help your little one to fall asleep more easily and sleep more peacefully! Use just a small amount of our herbal extract about 30 minutes before bed time to experience a peaceful night and sweet dreams for all! This herbal extract also works great for mild anxiety and focus. Catnip is rich in B vitamins and helps to produce a calm mood and ease stress. Many children have had great results with ADHD, anxiety, and other symptoms by using this throughout the day. Plus, the herbs are very gentle and kid-safe, and the tincture is alcohol-free. Organic catnip leaf, organic skullcap, organic passionflower, organic palm-derived vegetable glycerin, filtered water. Give by mouth about 30 minutes before bed, or first thing in the morning (for focus/anxiety). Add to juice or herbal tea to make it easier to take, if desired. Shelf Life: 1 year. Safe for people ages 1 and older. Talk to your doctor if you have special medical needs, especially if you are on mood-altering or anti-depression/anti-anxiety drugs before use. I’ve only used this a few times myself and with my youngest, she is 23 months. It has helped greatly! She wakes up just once a night and sleeps more soundly. She is normally very restless and will wake about three times. I suffer from severe anxiety and have a handful of serious stressers occurring in my life, which all affect my ability to get a restful night’s sleep. I have used this product a few times when I need/want some extra help getting a restful night sleep. 90% of the time I use it, I sleep soundly through the night without waking up at all when I typically am up to use the bathroom 1-2 times a night. I also have a noticeable increase in REM sleep and dreaming, plus I wake up feeling refreshed and ready for the day. This is like magic in a bottle! So I had been having sleep troubles earlier this summer. Often, I would have trouble falling asleep, taking maybe an hour longer than my husband after the lights had been turned out. And then, once I feel asleep I would wake in the night and not be able to fall back asleep for ~2 hrs! And then because it’s summer and brighter, I would usually wake up again in the 5 hour, instead of 6 or 630 like I wanted to. It was awful. I received this bottle about 2 weeks ago and I have had such better night sleep. I even looked back on my Fitbit sleep logs and the 6 weeks prior to getting this were awful, but the 2 weeks since have been awesome. I have been taking 12 drops before bed every night. Last night I didn’t take the drops, and I woke up in the night and couldn’t fall asleep for 2 hrs! It was horrible, again, and so I knew I should write a review. It seems to have made a dramatic difference for me. I use the Sleepy Time to help me sleep. It really helps. I’ve tried numerous natural products and this does the trick. It’s also helping with an itching problem I’m currently having. I take some drops and it calms the itching right down. My 2.5 yo is and has been a terrible sleeper. She usually takes forever to go to sleep and wakes up in the night to come to our bed. I haven’t noticed anything magical using either the sleep drops or the sleep lotion, though she does like to take the drops and put the lotion on at night. I wish it worked as well for her as the other reviewers mentioned. Not a magic bullet unfortunately. If I could give this 100 stars I would. It enabled me to quit taking meds to get to sleep. I have been able to sleep every night since taking it. I fall asleep so much easier, and am able to go back to sleep after waking. Meds didn’t even work for me most of the time. This product has changed my family’s life, because I am now able to be at my best with adequate sleep. I’m more capable of being the wife and mother I want to be because this defeats my insomnia. Thankyou Earthly! I brought this to a Family reunion since it can be more stressful then usual and harder to sleep. It worked WONDERFULLY to keep me remarkably calm when the family crazies would have normally induced a panic attack or at least an adrenaline response. It kept me sharp as a tact mentally, but no inexplicable “flight or fight” response. That is incredible! I shared with my siblings and everyone was looking for it before bed. A calm, happy, well rested house all around. If you are an adult that struggles with anxiety, I’d seriously give this a try. I give this nightly ro my 8,6 and 3 y/os. They ask for it everynight. 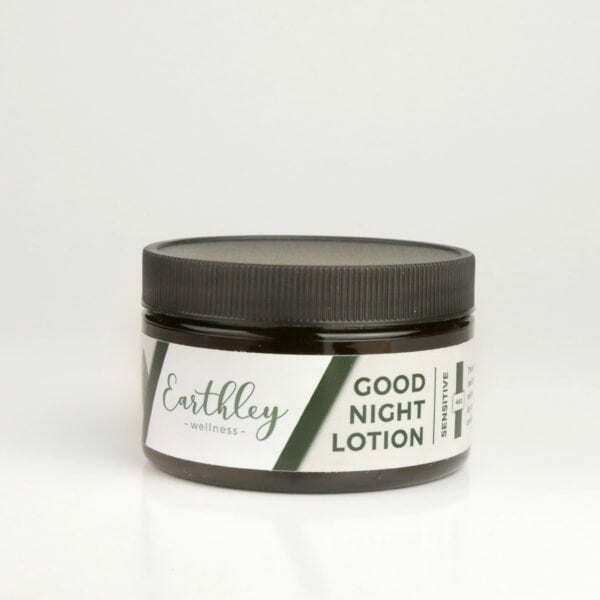 We use in conjunction with the good night lotion. They love it. This is my second time ordering this and we still love it! We got the smallest size and it lasted us 3 months. Given, I forgot some nights though and my son definitely knew it too. This is like a magical dream come true for a tired mama. I’m not sure how exactly it works, but it does! My 1 yo sleeps very sparatically, and this helps everyone get longer periods of more restful sleep. Yes it does exactly what it says. Calms. I use this almost every night and I give it to my 1 year old also. My son has always been a pretty great sleeper since he was a newborn so I got lucky with that! But i decided to buy this for nights when he’s sick or just having a hard time sleeping and it works great! Some nights he just dosent want to go to bed so I give this to him about 15 mins before he needs to be laying down and he will take it gladly no fuss at all about taste and then by the time the 15 mins is up he’s asking to go lay down instead of having to convoence him to do so! It’s a great product! I take this myself and it really helps on tossing and turning nights. The taste is good also. I’m give this to my toddler and it definitely helps him go to sleep faster than before. Part of my insomnia plan. Works like a charm. As far as taste goes, this is hands down my favorite extract from Earthly that I’ve tried. It’s sweet and mild, so even the kids don’t need coaxing to take it. It helps us all wind down at bed-times and I don’t have to take pills to help me sleep as often as I used to- yay! Just what my little one who was going through a sleep regression needed! No more constant waking, no more restlessness, no more fighting to go to sleep. We give the recommended just before bed so he can begin to calm down and relax, then he nurses right to sleep and is out for the night. And when we accidentally forget to give it or take it ourselves? No problem! It isn’t habit forming and doesn’t prevent the body from making its own melatonin, so we still rest so much better then we used to. This is a must have. This is tasty and soothing, really helps with winding down and getting sleepy. No more tossing and turning. My son and I both use this, it really helps both of us wind down but doesn’t leave us feeling groggy when we wake up! I LOVE this product! It tastes good, relaxes me and I sleep deeply! I feel great in the morning too! I gave this to my daughter every night before bed thinking it had a placebo effect until I ran out. After three nights, I ordered the four ounce bottle. This is by far my favorite Earthley product. We have added this to my 3 year olds night time regimine along with the magnesium rub. We love this product so much. I will say the first time my son took it he didn’t like the flavor but it must not be too bad because he has continued to take it without fuss. He now sleeps all night instead of his typical waking twice a night. We can’t rave about this enough, it has been a life saver for this tired momma! Thanks for your amazing products. In my arsenal for sleep. Works great. Doesn’t make you sleepy just helps you relax so you can go to sleep. Oh my, this stuff is great. I’ve been suffering with getting quality sleep recently due to diet change and I use this stuff along with the magnesium lotion and sleep like a bear. Tastes wonderful also which I think is important. I also give it to my 3 year old occasionally when she isn’t sleeping well or is still really energized at bed time. She loves it and looks forward to getting it. Highly recommended! Along with the tooth tamer and the calming tincture, this stuff is also magic in a bottle. My daughter is a horrible sleeper. Normal for us is around 3 hours total broken up in the night. Takes her forever to fall asleep, then she wakes up often. After receiving this, she passes right out, sleeps soundly, and wakes up happy in the morning. This has pretty much never happened before and she’s 26 months old. It has only safe ingredients, nothing habit forming or scary like most OTC sleep aids. I’m definitely ordering this on a regular basis….I can’t risk running out and going back to not sleeping!!! We love Sleepy Time Extract but, it’s too pricey for a family to use often. Life. Saver. My second child was a terrible sleeper from 3 months to 2.5 years and would wake up four or more times a night. Brutal after months and months! I finally found out about this when she was around 1 and gave it to her each night, and it significantly reduced her wake-up times and helped her be less grumpy the next days. This remedy is wonderful! Use this with my son when its time to get ready for bed or nap time and withing a few minutes hes calmer. Sleeps better to. Ive given this to my husband a few times when he gets restless and it works very nicely. Its definitely a must have in my natural medicine cabinet! I have ADHD, and it makes it hard for me to fall asleep since my thoughts never shut off. This helps so much. My mind is much calmer when I take this before bed, and I don’t have trouble falling asleep. It’s great for the kids too, especially when they’ve had a rough day and are restless at bedtime. They are able to get much better sleep, especially when paired with the Good Night Lotion. I’m going to have to order some more of this soon, because it’s almost gone, and i just don’t sleep as well without it. I fall asleep easier, sleep deeper, stay asleep, have dreams less, and wake up feeling well rested. Who wouldn’t want that? I purchased this for a feiend having trouble falling asleep at night. She actually falls asleep much faster and sleeps longer when using this. I have chronic insomnia my entire life. As an adult its gotten worse. Whiskey is great lol, but I have to say this stuff is infinitely better, and healthier! It brings peaceful rest with no groggy feeling the next day. I have been using this to help my daughter sleep. She was having sleep issues and I used it to aid in my sleep training of her. It helped to calm her down and before bed so that she wasn’t overtired as I was trying to help her get to sleep. Highly recommend. Love this stuff! My son and I take it every night before bed and it really seems to help! Tastes great too! My 2 year old takes it happily every night. I bought this to help my 3 yr old with some sleep issues we’d been having. She was waking multiple times a night and then struggling to get back to sleep. After a few days of regularly supplementing her with this at night I started to notice less waking and more restful sleep for her. I now also take this most nights before bed and I really believe it helps me to relax and sleep better as well. Our whole family is finally becoming more rested and having better attitudes during the day. Of course there are many different things that can contribute to restful sleep, but this has truly been a key for us! Love this stuff! It helps me sleep and the big bottle honestly lasts me a really long time. Very comparably priced to the many supplements (like melatonin pills) that you may need otherwise. Another must have! I pair this with Good Night Lotion and fall asleep easily and quickly and tend too stay asleep much better now! A lifesaver! This is not a “knock-out” formula. I’ve found that it helps relax me without drugging me, if that makes sense. My husband was reluctant to try it. I think he was concerned it would make him unable to function or drug him to sleep. He was pleasantly surprised that it helped him go to sleep without the drugged “hangover” that some other sleep remedies produce.